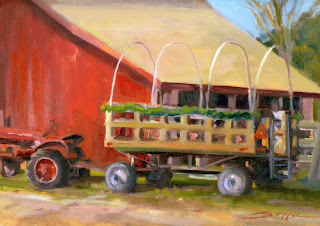 "Party Wagon" 9" x 12"
A farm next to my house was giving free rides with a tractor and wagon. This farm is always my default painting location when I don't feel like going very far. The wind was very troublesome that day and my pochade and painting ended up taking a nose dive face down into the dirt. Broke my tripod and sent turp all over me and my car. I was mad for a minute and then realized a bad day painting is better than a good day at my 8 to 5. I plan on trying out a new brand of paints I just bought..."LeFranc". I have heard many people rave about them, especially their White. They are very affordable. I also added Viridian Green and Yellow Ochre to my palette. Common on many peoples palette but new to me. I will let you know.